Root canal therapy is necessary when tooth decay, injury or fracture affect the inside of the tooth as well as the outer enamel. While no one wants a root canal, it’s actually a blessing for those who are experiencing severe pain related to their damaged tooth — the treatment alleviates discomfort and prevents extraction. How does the root canal procedure work? 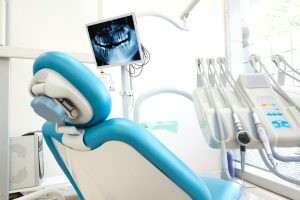 Let’s take a closer look at what you can expect from a root canal in Islip. Infected root canals are treated with a routine procedure that’s completed in about six steps. To best treat your root canal, your Islip dentist will thoroughly examine the tooth and its surrounding structure to put together the most effective treatment plan. Once everything is ready, we’ll administer anaesthesia to help you be as comfortable as possible through the whole process. There’s no need to worry you’ll feel anything throughout your treatment — with offerings in modern dentistry, many patients are so relaxed they actually doze through their root canal. After covering the surrounding teeth with a protective shield, your dentist drills a small access hole in the affected tooth. For back teeth, this hole is drilled on the chewing surface. Front teeth are accessed through the back surface. The infected tissue (the pulp, or the “nerve”) are removed through the access hole. This step is the “cleaning out” of the tooth, when your dentist takes out the diseased or dead tissue that’s not actually necessary for the tooth’s function. Once everything has been removed from the tooth and the inside has been cleaned, it’s time for shaping. Small, flexible instruments reshape the root canals to help them receive the new fillings. A filling that matches the shape of the canal is then placed. This step seals the canals, a crucial step that helps to prevent future infection and decay. Once the inside of the tooth has been sealed off from future decay, you’ll need a permanent restoration (a filling or crown) placed on top of the tooth. In serious cases, this step may be carried over into a second appointment to allow time for the original infection to heal. A temporary filling or crown will be placed in these cases. There’s no denying that root canals have a bad reputation, but the good news is this — there’s actually not anything to dread about the treatment. If you’ve got questions regarding your upcoming root canal near Oakdale, don’t hesitate to get in touch with the team at East Islip Dental Care! Contact us to discuss root canals and your oral health today.